Hard-boiling eggs is certainly not all that interesting, but it is an essential skill that is simple to master. If you are sick of eggs with that nasty greenish-grayish halo around a yolk that is so hard that it&apos;s nearly eligible for use in the PGA, look no further. I found this method in the excellent Anthony Bourdain&apos;s Les Halles Cookbook, and it's never done me wrong. It's so simple that you'll have it memorized after you try it a couple times. Put the eggs in a pot large enough so that they will fit in a single layer on the bottom. Add enough cold tap water to cover the eggs by two inches. Bring the water to a rapid boil, uncovered. As soon as the water boils shut off the heat and cover the pan. Let it sit, on the burner, exactly ten minutes. 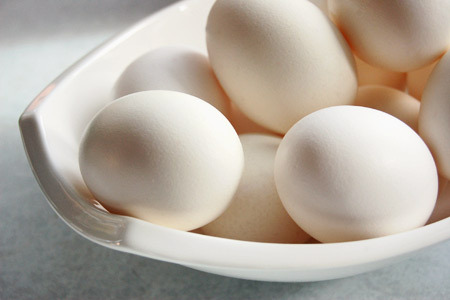 While the eggs are sitting, prepare an ice water bath in a large bowl. At ten minutes, dip out the eggs and move them to the ice water bath. Let the eggs cool completely. After the eggs cool. Crack and drop in boiling water for just a couple of seconds. This will cause the shell to expand and allow for perfect removal. No more green sulfur ring around the yolk when you do it this way. Nice tips, John. Wow! This is cool! I will have to give it a try! Thanks for sharing this 'standard operating procedure'. I agree with you that this is an essential skill - so basic and yet so underrated. I loathe HB eggs, but I'm loving that picture, man! Great shot. Thanks John, I can assure you this is a world wide problem ( yep! even in India)so many a thanks again for the great tip. If you poke a pin hole in the top of the fat end the yoke will center itself. Cut it in half to a perfectly centered yolk! If you add a splash of vinegar to the water, the water boils with very small bubbles. This prevents your eggs from cracking due to bouncing from the larger bubbles create by boiling water. The vinegar adds no taste that I can discern, but some find it enhances egg flavor (when poaching, for example). I've been doing this for years and have never had a cracked shell. As well, I believe shell peeling issues have more to do with the freshness of the egg than anything. I believe the freshness of the egg is very important as well. The worst eggs I've purchased are from Costco. Stick with one of the local supers if you're into this stuff. I eat 5 hb eggs a day as part of my workout regime. I've found Trader Joe's eggs to have a wonderful taste. I stopped cooking eggs for years. The eggs from the supermarket were too yucky. When it comes to peeling -- the fresher the egg, the more difficult to peel. If you use an egg that's a week or more old it will be easier to peel. Gotta try the "drop in boiling water for a second" method. I love making an egg salad sandwich with a freshly boiled egg. Tender and soft. So good. I usually use a dark pumpernickel bread. I just discovered a King's Sweet Hawaiin Bread. They now make it in loafs -- I lightly toast it, then gently heap on the devided egg. Yum. p.s. Just thought I'd mention: I don't work for Trader Joe's or King's Sweet Hawaiian bread. They've never heard of me, ya-da, ya-da, ya-da. I like to mention brand names sometimes when I find something I really like.